So today Air Asia announced another promotion but they also had some other news they chose not to share. I'm sure that there are many more increases but I haven't got the information to make the comparison. I really don't like the way that they try and bury the bad news under the hype of a promotion. Its becoming more Ryan Air like as each month goes by which is not a good thing. I guess the rule is to always check the bottom line when comparing flight costs. Have you ever been away on holiday and found that you suddenly have less money than you expected? Most of the time this is because you either spent too much time shopping or had a few too many beers the night before and don’t remember all the expensive drinks that you bought. Occasionally there have been a few times that I just couldn't account for where some of the money had gone and from time to time the in-room safe would also malfunction. Whilst looking for some info on chocolate I came across this site and the troubles that the writer had during his stay at a Cameron Highlands hotel made me wonder if I’ve also been scammed in the past? If a safe is not safe then what is? A new restaurant & bar which opened to the public on the 13th Feb at the Pavilion in KL has generated a fair bit of excitement and will probably be the hottest place to go in February. The Market Hall restaurant and its sister bar Bedroom are from the same team behind The Apartment, Italiannies and TGI Fridays’s. The restaurant concept is based around a European open market hall with shelves stacked with condiments and other delectables along with a visible kitchen area for diners to see. A key aspect of any food market is freshness and the Market Hall prides itself on the freshness of the ingredients utilising a farm to plate concept skipping any extra stops to remove unnecessary ingredients. The menu is European style containing a variety of pasta, meat, pizza and fish dishes with the meat locally sourced and the pasta handmade every day. The jars and packets of food around the restaurant are available for purchase along with some take away items. I usually avoid new restaurants for the first few weeks of their operation to allow them time to iron out any teething problems however I ended up at the Market Hall because a) I didn’t realise that it only opened on the 13th and b) it was my wife's birthday and she requested that we try it. Being a new restaurant and valentine’s day I was expecting the worst with it likely to be full and having a limited set menu. Upon arrival we were informed that the wait time was only about 20 mins and that the full menu was available which was fantastic so rather than walk around the mall whilst waiting for a table we elected to wait in the bar area. Due to it being early evening the bar was almost empty however it provided us an opportunity to look around and sample a few drinks in relative peace. The bar is quite dark so unfortunately the camera on my phone wasn’t able to produce particularly good pictures. With a name like Bedroom it was surprising that there were no beds, the seating compromising of dark coloured sofa’s, chairs and stalls. Not really much to report on the bar other then the only draft beer available in a pint glass is Guinness. Tiger, Heineken and Paulaner are also available on draught but only in small glass. This is not uncommon in KL but personally I can’t understand why this is so and being English I’m partial to my beer being served in a pint glass. I’m keen to find out what the night crowd is like and will probably check out the place on a Friday or Saturday night. After around 30 mins I received a call to inform me that my table was ready and we proceeded back through to the restaurant. We were shown to the table and then a few of the teething problems then began, causing myself to have to get up and ask for a menu and then after a further wait stop a waiter and ask to make an order. The staff were polite but not yet up to speed with the electronic pda style ordering system. For a starter I ordered sliced topside of beef glazed in salsa verde served with poached egg. To try and ensure that the food comes as a 3 course meal rather than haphazard like some establishments in this part of the world the instructions were clearly articulated and understood by the waiter. A short while later I was a little disappointed when my starter was brought out along with a side dish of vegetables from the main course. I sent the vegetables back which caused a little confusion but no real problem. The starter was absolutely superb with the beef being very tender and the salsa verde having just the right flavour. I was a little surprised that the egg was cold and served as a salad item but it worked very well so no complaints. The drinks menu is quite comprehensive and contains several cocktails and shooters including flatliners which are mixed in the the adjacent bar. Our original choice of wine was out of stock however another was suggested and a nice touch was that the bar manager stopped at our table later to check that the wine was ok.
For the main course I had hoped to order the lamb balti pie however this had finished so I went for a medium cooked rib eye steak with accompanying vegetables which are additional order items and my wife ordered Tagliolini with fresh crabmeat and chilli wine sauce. Unfortunately the teething problems surfaced again with the herb roasted potatoes being left off which caused a minor issue but this was managed and the delay was minimal. Now back to the food and what can I say about it other than perfectly cooked and absolutely delicious! The steak was cooked to perfection along with the broccoli and the potatoes when they arrived were well worth waiting for. I also tried my wife’s pasta and the combination of the crab, chilli oil sauce and pasta was absolutely delightful. I’m a fan of fresh bread and it would have been nice if a fresh breadbasket was available with meals although I didn’t ask anybody if it was. Whilst discussing what to have dessert a member of the management team (Nicola) approached us to apologise for the earlier issues and upon hearing that it was my wife’s birthday without prompting he rushed off and produced a special desert dish for us to share – many thanks!! When the earlier teething issues occurred I’m pleased to say full kudos to the management team who were onto it straight away and I would like to express my thanks to the General Manager (Richard) for taking the time out to listen to our feedback and chat about the restaurant. Many aspects of the service were good with my wine glass and drinking water refilled on a regular basis and a friendly management team. 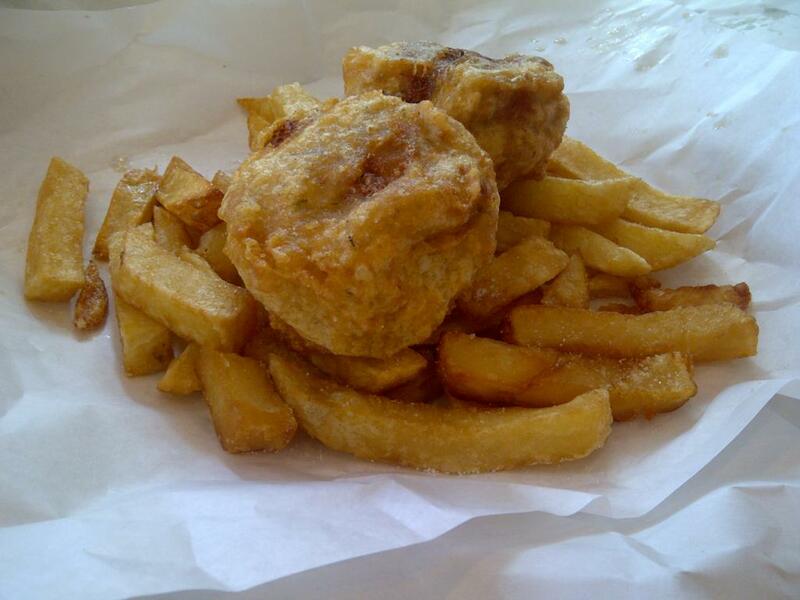 I hope to return within a month and sample the balti pie and will update you with my findings. Soon after arriving in Malaysia back in 2000 I remember heading for the malls and commenting on the lack of strollers being used compared to the UK. In KL it seemed that if the child was capable of walking then typically it was allowed to run about otherwise a parent or maid carried them. Over the past 11 yrs the quality of life in KL seems to have improved with more and better models of cars Another byproduct of the increase in wealth is now a new menace for walkers to look out for in previously safe places. A recent observation I made having been dragged around Ikea a few too many times was the increase in numbers of strollers being used compared to a just few years ago. Now the problem I have with this is that the parents often treat the stroller like they treat their Kancil (small malaysian car) which results in either myself getting run over or it left in the middle of the walking way causing a jam of walkers and more strollers. Furthermore the stroller craze is causing lifts to be full and dangerous balancing acts on escalators to take place. As any visitor or resident knows, the driving and parking habits KL are pretty bad and these will only get worse as the young kids that are strapped into the strollers are influenced at a young age by their inconsiderate parents. The roads and pavements in KL are not really conducive to walking so probably the only safe places to walk were the gargantuan malls scattered around the klang valley however this haven is now under threat due to the ‘Mat stroller’ crew invasion. Another thing that really stumps me is that people will happily pay out for a fancy stroller but when it comes to kids car seats they shy away. The number of kids I see sitting on parents laps including the drivers, not strapped in or even hanging out of sunroofs on MPV’s beggars belief and the parents just don’t seem to grasp the risk of serious or fatal injury that can occur if an accident were to happen. 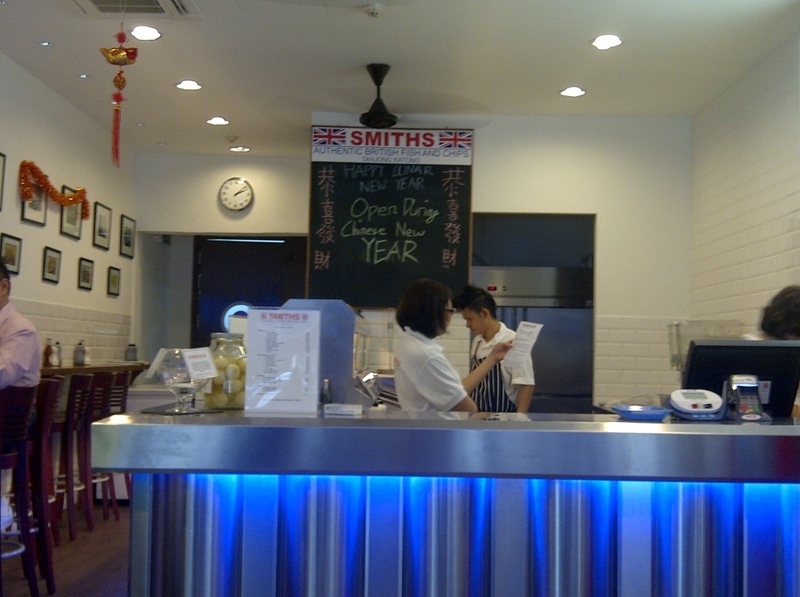 Smiths - The best fish and chips in SG? One of the great things about living in this part of the world is the abundance of fresh affordable sea food. 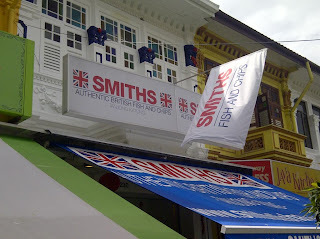 With so many cooking styles available it is surprising that fish and chips is a popular dish in Singapore, perhaps due to relative closeness to Australia or maybe just hangover from it's colonial past. 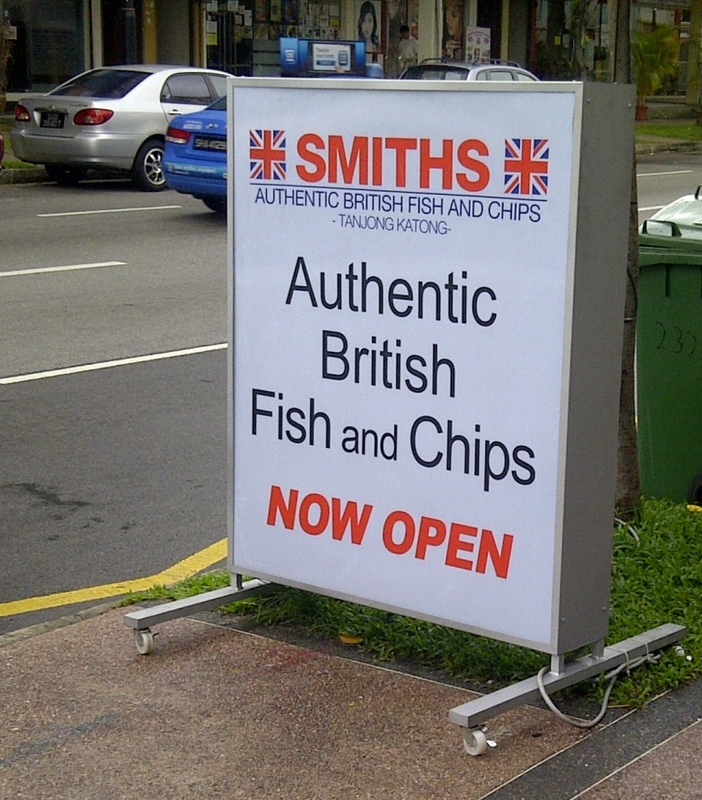 In Singapore there are several fish related restaurant chains which serve a reasonable fish and chips however the chips are your standard frozen type that you find in almost every other restaurant. 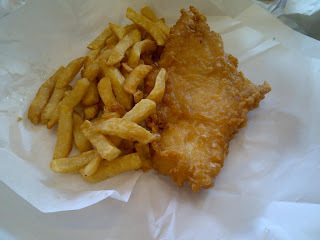 As a Brit I have to say that there nothing quite like some good old british style fish and chips. 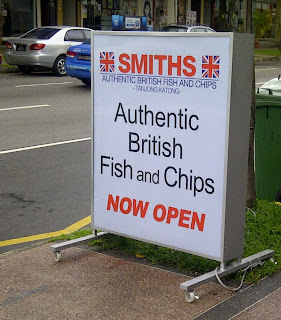 Up until recently the only british style outlet in SG was something found in the food court of a few malls and I can assure you that it was hugely disappointing. Towards the end of 2010 Smiths Authentic British Fish & Chips opened in Tanjong Katong Road and I’ve been meaning to check it out for some time. For the past few days the weather had been very british with rain and sunshine appearing at 15 minute intervals so I took it as a sign that it was time to make a visit to Smiths. The restaurant is open fronted and upon entering the familiar smell of a local UK chippy was in abundance and it was nice see a large fryer with the above food warmer as you would find back in the UK. There are several side orders available as well such as mushy peas, baked beans and pickled onions. Today I opted for the cod and my friend tried the fishcakes. Unlike a busy UK chippy the food is cooked fresh to order and despite there being only a few tables of customers the food took a little while to come. This is not a major criticism but more of an observation and is perhaps due to some preparation needed. 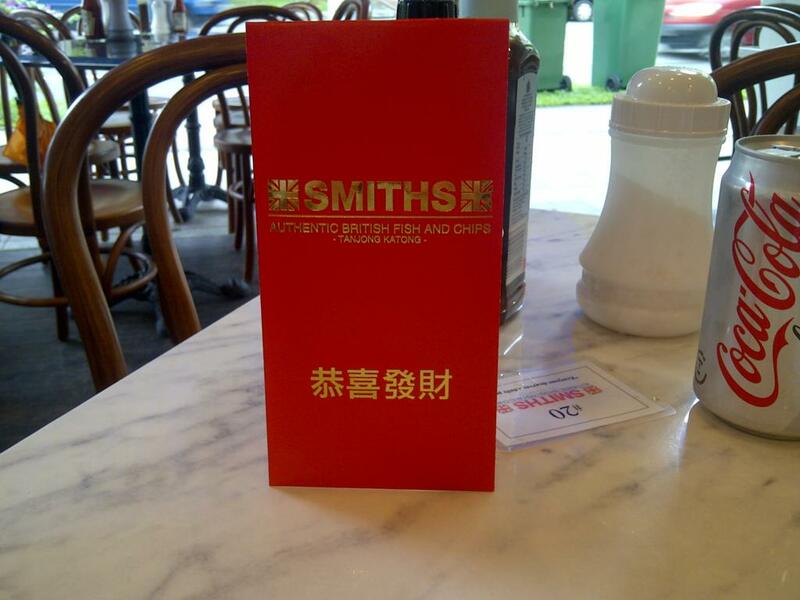 With Chinese New Year taking place at the end of the week we were given an ang pow packet which sadly didn't contain money but did have a money off voucher for a kids meal. The food is served wrapped in paper and once ready is collected from the counter. Despite some negative comments on another food site I found the portions to be a good size as you can see from the pictures below. In addition to this I had a side of baked beans and not being a mushy peas lover I gave them a miss. Whilst eating the incessant rain/sun cycle continued and in the relative coolness I almost felt like I was back in the UK on a summer holiday. As well as some fairly standard softdrinks several beers are also available which include Boddingtons and San Miguel. I thoroughly enjoyed my lunch I hope the oiliness of the fish is reduced and only then can it match that of my local chippy in the UK. Unlike most chippy's I know Smiths doesn’t sell meat pies and savaloys which is a shame because I’m rather partial to a pie and chips. To my knowledge Smiths is the best british fish and chips restaurant in Singapore and I look forward to returning again.